If you suffer from asthma, you may want to swap your prescription medications for some powerful and effective Chinese herbs. Specifically, ASHMI asthma treatment. ASHMI stands for Anti-Asthma Herbal Medicine Intervention. ASHMI is a combination of three Chinese herbal extracts: Lingzhi Mushroom (aka Reishi Mushroom), Kushen (aka Sophora Root), and Licorice Root (aka Gancao). ASHMI does not include Ma Huang, which is used globally as an asthma herbal remedy. The original formulation of ASHMI was developed by Dr. Xiu-Min Li of the Mount Sinai School of Medicine in New York, in collaboration with Dr. Hugh Sampson, also from the Mount Sinai School of Medicine in New York, as a simplified version of a traditional Chinese herbal combination of 14 herbs known as MSSM-002. MSSM-002 was originally designed by Weifang Pharmaceutical Manufacturing. The published study chronicles the results of an experiment conducted by researchers from Weifang Asthma Hospital and Weifang School of Medicine in China, along with the Mount Sinai School of Medicine in New York. 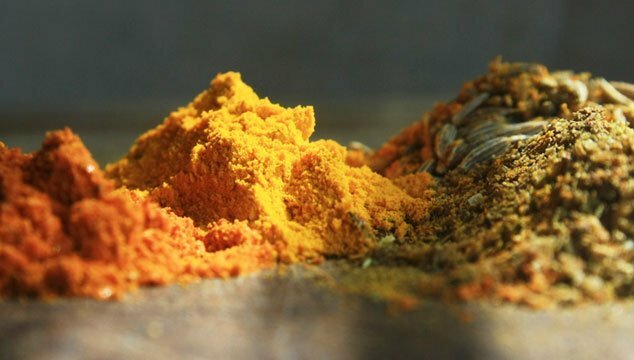 The researchers reported that an oral combination of three Chinese herbs could be as effective as conventional asthma medicines — without the serious side effects! The researchers were looking for an asthma treatment equally as effective as Corticosteroids, a common and conventional asthma treatment, minus the adverse side effects experienced by Corticosteroid users. Specifically, Corticosteroids have been shown to increase susceptibility to infection and slow growth rates in children. 91 patients with moderate to severe persistent asthma were admitted to the Weifang Asthma Hospital for a four week double-blind study. 45 of the asthma patients received 20mg of prednisone per day and placebo capsules resembling ASHMI. 46 of the asthma patients were given ASHMI along with placebo tablets resembling 20mg of prednisone. The results were very positive. ASHMI had a beneficial effect on both TH1 and TH2 cytokine levels and absolutely no adverse effects on adrenal function in the study participants. Additionally, the ASHMI group experienced significantly less gastric discomfort and no weight gain. The effect of prednisone on lung function was reported by the researchers to be “slightly, but significantly greater” than that of ASHMI. But, the prednisone group experienced both significant weight-gain and gastric discomfort. As a result of the study findings, the National Center for Complementary and Alternative Medicine (NCCAM) announced the funding of three “Centers of Excellence” which will explore therapies used in traditional Chinese medicine, including acupuncture and Chinese herbal mixtures. One of the selected centers will be called the “Center for Chinese Herbal Therapy” located at the Mount Sinai School of Medicine, New York, NY and led by Xiu-Min Li, M.D. The researchers are responsible for investigating ASHMI as a therapy for allergic asthma. Studies of ASHMI will look at mechanisms of action in an animal model, characterize the herbs’ active components and investigate the formula’s use in human asthma patients. As a result of my research and specifically because of the study I mentioned above, I decided to try and buy ASHMI. The problem was, I couldn’t find it! I got frustrated pretty early on in my quest, so I went to my neighborhood “Vitamin Shoppe” (brick n mortar store), bought Lingzhi Mushroom and Licorice Root supplements and made my own “homemade” ASHMI. (Unfortunately, I have yet to find sophora root in supplement form, although I did find that I could buy it in bulk). Anyway, my family and I began to take our homemade ASHMI supplements (along with Olive leaf extract and wild oregano) and have never looked back. We have had some pretty remarkable results and are very happy and thankful for Dr. Li and her continued research! Hi – I read your article re ASHMI for asthma. Do you have asthma? How long did you try the Allergy Research Group Version? What we’re the changes (If any) you experienced? Would you use again? Why? Why not? I am mother of 5 year old with multiple food allergies and asthma. Always seeking ways to healing. My name is Heather. I’m Cody’s wife. I’m sorry it’s taken so long to get back to you, but I work in retail and have a very “uneven” schedule. Cody asked me to respond to your email personally, after he read it. I was very thankful to have made it out of the hospital alive and breathing, but I (& Cody even more) was also determined to do some research to see if I could find something natural that could help me breathe better and keep me out of the hospital better than the medication I was taking. At the time I had my severe attack, I was taking advair everyday. I also used my albuterol inhaler once or twice a day, everyday and was administering nebulizer treatments to myself several times a month. Then everything really changed! Cody discovered ASHMI, but hadn’t yet discovered phytocort. He put together a “homemade” ASHMI with supplements he bought from vitamin stores. That’s when I started taking lingzhi mushroom extract, licorice root extract, olive leaf extract and wild oregano supplements. Since I began the supplementation about 3 years ago, I have received very dramatic benefits and no side effects (as far as my doctor and I can tell). I have not had to take any Advair. I have only used my albuterol inhaler two or three times a year over the past three years (during the fall of each year). I can’t remember the last time I’ve had to administer a nebulizer treatment, but it’s definitely been over 2 years. I still carry my albuterol with me everywhere I go, because I’m scared to death of not having it, if I ever needed it. I take two capsules of Phytocort and one each of the olive leaf extract and wild oregano supplements, twice a day. I’ve been taking the phytocort for almost a year. Before phytocort, I was taking my homemade ASHMI for about two years. I like taking the phytocort because the ingredients are already packaged into one supplement and it’s cheaper to buy one bottle of phytocort than putting ASHMI together myself. I honestly have not noticed a difference in my breathing between my homemade ASHMI and the phytocort supplements. I tell everyone that asks me to NOT expect the same results I’ve experienced. I’ve learned that individuals experience different results and side effects from taking the same supplements and medications. So, please DO NOT expect the same results that I have experienced. I hope that my email has answered some of your questions (I’ve tried my best). I also hope that you continue to research progressive asthma treatments and that you find one or more that may work for your child. Thanks for visiting our site and all my best. Lingzhi mushrooms are one of the oldest and most effective mushrooms used in traditional Chinese medicine. 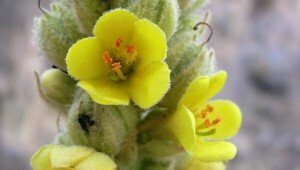 They have been effectively used as anti-inflammatories, antivirals, anti-parasitics, anti-fungals, anti-diabetics and anti-hypotensives.They have also been shown to effectively lower blood pressure, cholesterol, and blood sugar. Numerous studies of Lingzhi mushrooms have established their effectiveness in the treatment of a wide range of diseases and symptoms. The reason I have written about them here (and take them myself), is because of their ability to strengthen the respiratory system and their healing effect on the lungs. It has been shown that Lingzhi mushrooms are particularly beneficial for individuals with asthma, cough and other respiratory complaints. In an article entitled, “Medicinal Mushrooms”, published in the January/February 1997 Issue of Herbs for Health, written by Christopher Hobbs, a population study conducted in the 1970s is offered as validation confirming this claim. The article describes a population study conducted on more than 2000 Chinese with chronic bronchitis. They were instructed to consume Lingzhi mushroom syrup over a period of two weeks. Approximately 90% of this population reported significantly improved breathing as well as improved appetite. 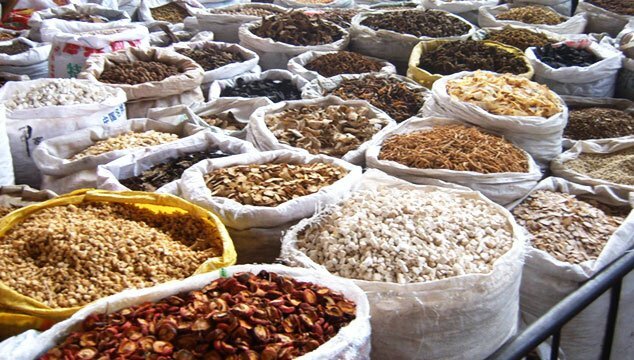 Lingzhi mushrooms have also been successfully used in cardiovascular treatment, in bronchitis prevention, in the treatment of high blood pressure, hepatitis, HIV support, fatigue, allergies, chemotherapy support, altitude sickness, and high triglycerides. Due to the presence of triterpenes, lingzhi mushrooms are understood as an adaptogenic, anti-allergenic and anti-hypertensive. Lingzhi mushrooms are soft, corky, and flat polypores. They have a kidney shaped, red varnished cap. Lingzhi mushrooms lack gills on their underside, and instead depending on their age, have white to dull brown fine pores, which they use to release their spores, the very reason their morphological classification is polypores. Yellow Lingzhi Mushroom – Spleen. Lingzhi mushrooms can be consumed in high doses with other medications due to their generally slight side effects. Lingzhi has been shown to enhance the immune system and lessen nervous tension, which may help normalize and balance the body. Lingzhi mushroom formulations are easily prepared. Simmering thinly sliced or pulverized Lingzhi mushrooms in a pot of boiling water for two hours is the traditional method. The resulting liquid is normally bitter in taste, with the less active black Lingzhi mushroom tasting less bitter than the more active red Lingzhi mushroom. The liquid can also be used to make an extract in liquid, capsule, or powder form, and be added to a formula decoction. Some studies have shown that long-term use of Lingzhi mushrooms (approximately 4 months) can result in very mild side effects. These have included stomach upset, nosebleed, and dryness of the nasal passages, mouth and throat. These side effects were completely avoided by discontinuing the use of Lingzhi mushrooms for approximately 1 month after taking them for four months, then taking them again for four months. Lingzhi mushrooms are available for sale all over the world. Both polysaccharides, and triterpenoids are available as a hot water extract and an alcohol extract. 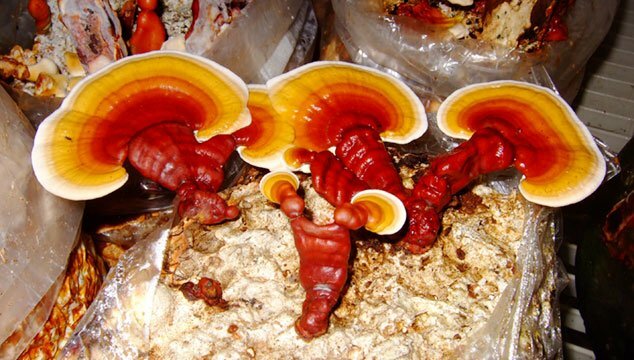 Lingzhi mushroom extracts may also be called reishi, reishi mushroom, ganoderma, ling zhi, and ling-zhi. [UPDATE]: I’ve written an article about an herbal asthma treatment called “ASHMI Clear Breathing With Chinese Herbs” which describes how Dr. Xiu-Min Li of the Mount Sinai School of Medicine in New York combines Lingzhi Mushroom with three other herbs to produce a natural and effective asthma treatment. It’s a good read. Licorice root asthma treatments have a well earned reputation as being highly effective. Licorice Root (also known as Gan Cao) in Chinese Medicine, has been used successfully for thousands of years to relieve asthma symptoms and breathing problems caused by bronchitis and many other chronic and short-term respiratory illnesses. Licorice root has been shown to effectively soothe swollen airways, acting as an effective anti-inflammatory. It has also been found to effectively inhibit histamine release, inhibit coughing and has highly effective expectorant effects. Licorice root eases congestion and coughing, helping to loosen and thin mucus and airways. It aids in the relaxation of bronchial spasms and soothes soreness and tightness in the throat. 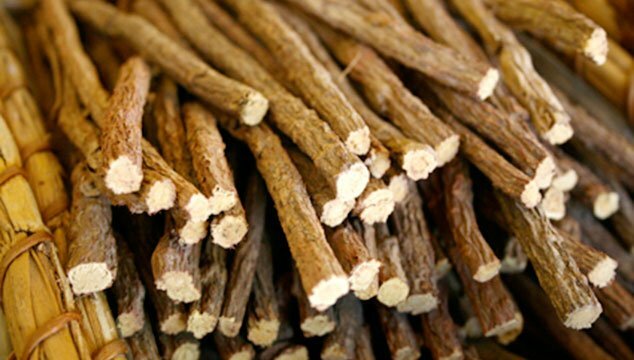 In addition to its use as an asthma treatment, Licorice root has a well documented history of aiding in the treatment of colds and flu, depression, emphysema, gingivitis, HIV support, viral infections, fungal infections, ulcers, psoriasis, tuberculosis and arthritis. Licorice root has also proven to be an effective anti-allergenic useful for the treatment of bronchial asthma, hayfever, conjunctivitis and allergic rhinitis. 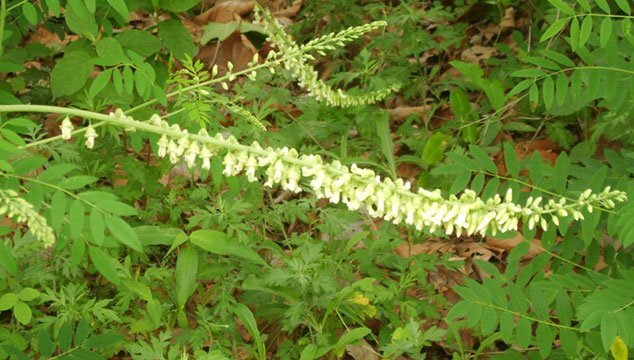 Licorice Root also has an aspirin like effect, which helps in the treatment of fevers and pain relief from headaches. Traditional methods of taking Licorice Root include drinking it as a tea, chewing on the root (not recommended) and in capsule form. Mild side effects have been documented in the prolonged use of Licorice root, including water retention, increased blood pressure, and mild adrenal stimulation. Prolonged use should definitely be avoided if you suffer from high blood pressure. Be sure to discuss treatment options with your care providers. Licorice root is available for sale in all parts of the world as an extract, pill and capsule, both in formulations containing a combination of multiple herbs and by itself. [UPDATE]: I’ve written an article about an herbal asthma treatment called “ASHMI Clear Breathing With Chinese Herbs” which describes how Dr. Xiu-Min Li of the Mount Sinai School of Medicine in New York combines Licorice Root (aka Gancao) with three other herbs to produce a natural and effective asthma treatment. It’s a good read. Take a look. Kushen is the Chinese name of the root of Sophora flavescens. It is also known as Sophora Root and is a member of the pea and bean family. Kushen has been used successfully as an herbal medicine to treat a wide variety of conditions for thousands of years. My interest in Kushen (Sophora Root) was piqued because of two compounds found in Kushen: Matrine and Oxymatrine. Kushen has been shown to be of significant benefit in the treatment of asthma, bronchitis, eczema, fever, insomnia, cardiac arrhythmia, cancer, dysentery, inflammation, hepatitis B, hepatitis C, vaginitis, psoriasis, and conjunctivitis. The alkaloids Matrine and Oxymatrine, as found in Kushen, inhibit histamine release, inhibit the urge to cough (antitussive), and demonstrate expectorant effects. One study in particular shows a great deal of promise in the use of Kushen in the treatment of asthma and other respiratory disorders. 517 cases of asthmatic bronchitis were treated with Kushen, resulting in an 86.5% effectiveness rate and a 38.8% marked effectiveness rate. Kushen can be (and usually is) consumed in extract form with other medications. Due to its generally slight side effects, and low toxicity, it is considered to be a safe and effective medication in traditional Chinese Medicine. The side effects of Kushen are evident only at extremely high dosage levels, which include dizziness, gastric upset and evidence of immunosuppression. Kushen is found in the desert area of northern part of China, especially in Ningxia, Gansu, Qinghai, Xinjiang, Inner Mongolia. It is mainly found in the desert area of Ningxia. Kushen is readily available all over the world. It is often used in formulations containing a combination of multiple herbs, but can also be found as a full spectrum extract. [UPDATE]: I’ve written an article about an herbal asthma treatment called “ASHMI Clear Breathing With Chinese Herbs” which describes how Dr. Xiu-Min Li of the Mount Sinai School of Medicine in New York combines Sophora Root (aka kushen) with three other herbs to produce a natural and effective asthma treatment. It’s a good read. Take a look. It was formulated and used by Dr. Xiumin Li at the Sino-Japan Friendship Hospital in Beijing. It is also the basis from which Dr. Li created her ASHMI Asthma Treatment herbal combination.